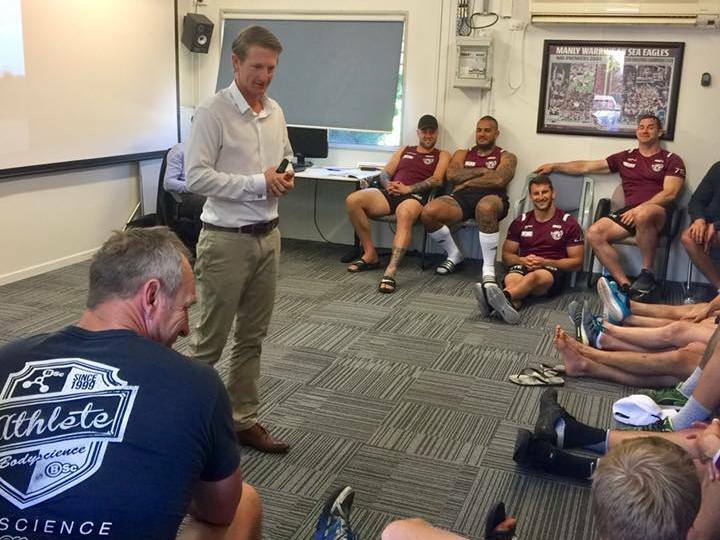 Inspirational speaker Michael Crossland talks to the Many Sea Eagles. One of Australia's most inspiring speakers will talk about his extraordinary life as a cancer survivor at the fifth annual COUCH Corporate Lunch and Charity Auction this Thursday. With his presentations described as "raw, real and truly life-changing", Michael Crossland defied the odds from birth. Not only did he survive life-threatening cancer as a baby, he was also the only survivor of a horrific drug trial. Despite being told "what he couldn't do" throughout his young life, Michael has become an accomplished businessman and elite sportsman. The COUCH Corporate Lunch and Charity Auction is being held at a crucial time for the local cancer charity with work set to begin on the COUCH Wellness Centre on a site near Reservoir Rd. FGF Developments has been awarded the building contract for the $3.1 million facility, with the first sod to be turned in August. Money raised from Thursday's event will go directly to the cost of construction and operation of the Wellness Centre. COUCH board member Michael Nelson said the corporate lunch and auction was the major fundraiser for the local charity leading into the Cairns IRONMAN Festival. "We're really grateful to be the official charity for the IRONMAN Cairns 70.3 Triathlon, and we have approximately 80 people in the COUCH Triathlon Team all of whom are fundraising as part of their preparation for the event," Mr Nelson said. This is the 5th lunch we have held and over the years we've attracted a fantastic array of speakers including Michael Milton, Australia’s most successful Paralympian, and cancer survivor Sharon Cohrs, the first Breast Cancer survivor to conquer Mt Everest. "Michael Crossland continues this tradition - it will be a lunch you won't want to miss."